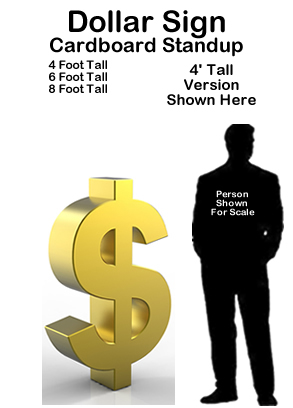 Dollar Sign Cardboard Cutout Standup Prop - Dino Rentos Studios, INC. This Prop is NOT 3D. It is a flat cardboard cutout that simulates 3D. Awsome Flat Cardboard Cutout- Print on one Side. Upgrade ! And have the back of Dollar Sign printed also.